The best of Kuala Lumpur in just one day! 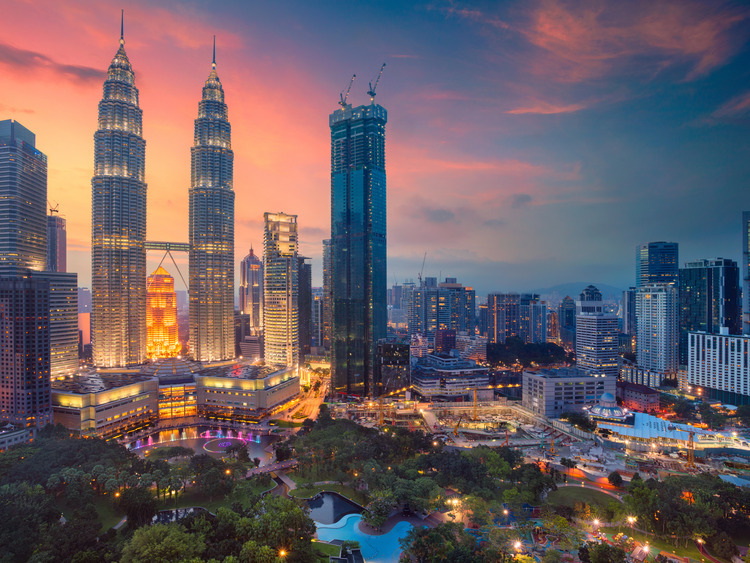 We will visit the main monuments, walk through beautiful botanical gardens and experience the thrill of admiring the city from 171 metres high on the Sky Bridge, the spectacular walkway that joins the Petronas Twin Towers. We start our tour of the Malaysian capital with a visit to the National Monument, located in the Kuala Lumpur Lake Gardens, which was built in memory of those who lost their lives in the Second World War. This imposing monument is the largest bronze statue in the world and was sculpted in 1966 by Felix de Weldon, who also created the Iwo Jima Memorial at Arlington cemetery. Then we will visit Lake Gardens, which span over 90 hectares of undulating land and boast extremely varied flora, including wonderful exotic species of orchid and colourful hibiscus plants. We will return to the coach and travel to Independence Square, a large open space where many local events are held such as New Year celebrations. In the square, we will have the chance to admire the Sultan Abdul Samad Building, the most imposing and most photographed in the entire city, and St Mary's Cathedral, one of the oldest Christian churches in Malaysia. Then we will head to the Petronas Towers, the tallest twin skyscrapers in the world, which symbolise an open door to the future and offer spectacular panoramic views of Kuala Lumpur. We will head up to the Sky Bridge, an enclosed tunnel that is a real engineering feat and joins the two towers 171 metres high, allowing us to walk from one to the other. Looking out through the huge windows we can admire endless views of the city. After the visit, we will have free time to spend in the Suria KLCC shopping centre, one of the best in Kuala Lumpur, which is located inside the Petronas Towers. We can wander around the countless shops and stop at one of the numerous restaurants for a tasty lunch before gathering at the meeting point and returning to the ship.